The Commonwealth Club of California is the nation's oldest and largest public affairs forum, bringing together its 16,000 members for over 400 annual events on topics ranging across politics, culture, society and the economy. 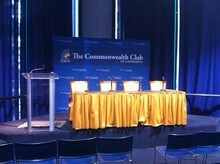 Founded in 1903, the Commonwealth Club has played host to a diverse and distinctive array of speakers, from Teddy Roosevelt in 1911 to Erin Brockovich in 2001. Along the way, Martin Luther King, Ronald Reagan, Bill Clinton and Bill Gates have all given landmark speeches at the Club.